There’s no denying the power of art. It can be soothing, inspiring, provocative and arrive in myriad forms. From sculptures and static works, painting, photography, poetry, dance, architecture, music and theatre, art is a force that transforms communities, helps to heal, drives commerce and adds vitality to communities. Clackamas County is the fortunate home to a full palette of artistic opportunity. Man-made works juxtaposed with natural beauty seem a perfect compliment and impetus to grow our communities…and we are. Clackamas County Arts Alliance is the hub for all things art-related with a stated mission of, “Keeping art central to life in Clackamas County.” The purpose of our work is to support, develop and promote access to all the arts in every county community. Initiated in 1994, Clackamas County Arts Alliance has evolved from an advisory board named Arts Action Alliance, appointed by County Commissioners to advise and advocate for arts. In 2003, the Arts Action Alliance became a tax-exempt non-profit organization under the name Arts Action Alliance Foundation. 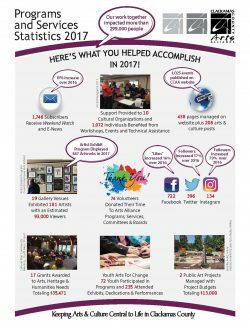 In 2011, the name was changed to Clackamas County Arts Alliance, which today is the driving force for social, cultural, historic and arts information in Clackamas County. The breadth of activities is wide, ranging from grant programs to public art exhibits to a full spectrum of art-related projects, performances and displays. The scope of work for Clackamas County Arts Alliance has grown in response to county-wide demands. Whether to the benefit of at-risk youth, school programs, tourism initiatives, community beautification or healthcare environments using art as a healing tool, the value of the arts in our communities cannot be understated. Art is essential to the social and economic well-being of our county. County citizen surveys echo this sentiment. “Access to the arts and cultural amenities” consistently ranks as a key element to a “Complete Community”. Did you know that in 2010 in Clackamas County 1,385 creative industry entrepreneurs and businesses employed 15,980 people? 25% of Clackamas County residents reported they participated in arts and culture. Per capita spending by county residents in 2010 was above the national, state and regional averages. In Clackamas County “art” is an economic force. There is no denying the influence and power of the arts in attracting tourists. Arts travelers are ideal tourists — they stay longer and spend more. Lively and attractive communities draw visitors and attract investment. 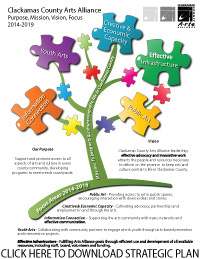 Clackamas County Arts Alliance is heading down an exciting and important path. Through their partners and the community, Clackamas County Arts Alliance has become a visible and important force in beautifying and enriching dozens of Clackamas County communities. and building healthy, vibrant communities. They all demonstrate their support through financial investment in artists, actors, musicians, writers, theaters, libraries and other cultural organizations, opportunities and creative people.